When Bill Wilson, with his friend Dr. Bob Smith, founded Alcoholics Anonymous in 1935, his hope was that AA would become a safe haven for those who suffered from this disease. Thirty years after his death, AA continues to help millions of alcoholics recover from what had been commonly regarded as a hopeless addiction. Still, while Wilson was a visionary for millions, he was no saint. After cofounding Alcoholics Anonymous, he stayed sober for over thirty-five years, helping countless thousands rebuild their lives. But at the same time, Wilson suffered form debilitating bouts of clinical depression, was a womanizer, and experimented with LSD. Francis Hartigan, the former secretary and confidant to Wilson's wife, Lois, has exhaustively researched his subject, writing with a complete insider's knowledge. Drawing on extensive interviews with Lois Wilson and scores of early members of AA, he fully explores Wilson's organizational genius, his devotion to the cause, and almost martyr-like selflessness. That Wilson, like all of us, had to struggle with his own personal demons makes this biography all the more moving and inspirational. Hartigan reveals the story of Wilson's life to be as humorous, horrific, and powerful as any of the AA vignettes told daily around the world. Francis Hartigan is a corporate communications professional who has worked with the print media and produced documentaries. He was the secretary of and confidant to Bill Wilson's wife, Lois. He lives in New York City. An up-close and personal view of an exceedingly strange and influential man. [Hartigan's] book approaches Wilson's life with refreshing candor. A readable, informative, succinct, respectful, but nonreverential biography of Bill Wilson...Hartigan depicts Wilson as not only an organizational genius, but also as an amazingly resilient, largely appealing, and otherwise immensely interesting human being. Francis Hartigan has written a thorough, workmanlike biography of Bill Wilson that details all Wilson's sinnings and failings and his crowning achievement, the founding of AA. 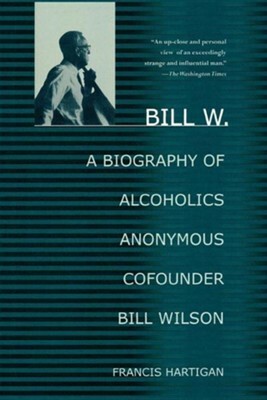 I'm the author/artist and I want to review Bill W.: A Biography of Alcoholics Anonymous Cofounder Bill Wilson.